Currently, research and development for the functional demonstrator for the Czech Republic’s Voják 21 (V21) or Soldier 21 programme is being undertaken by local firm VOP-026. The company is providing demonstrators to support definition and testing of the requirement. In the context of a standard procurement phase, he expects the Request for Proposals to be issued as early as the second half of 2009. Final numbers have not yet been decided but he believes that there will be a commitment to acquire roughly 900 systems, sufficient for two to three battalions up to 2014-15. A requirement for reduced capability systems, expected to be without the C4I system also exists. After this date, plans are being discussed for an improved capability – possibly a second generation system, taking numbers to over 3000. VOP-026 began work on the V21 programme in 2004, the only company to be funded by the MoD. 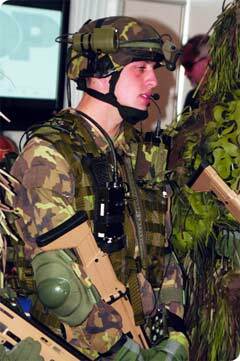 From then until 2007, a single functional demonstrator was developed under work designated as ‘Vojbud’. After successful completion, follow on work under the ‘Sesedák’ project was pursued from 2007-8, designed to produce six infantry systems and a single command unit, collectively entitled ‘Modular Combat System of V21’ or MBK21. Work also included integration with vehicles, the system using a single BAE Systems Hagglunds BvS10 all terrain vehicle with remote weapon system for the purposes of trials.